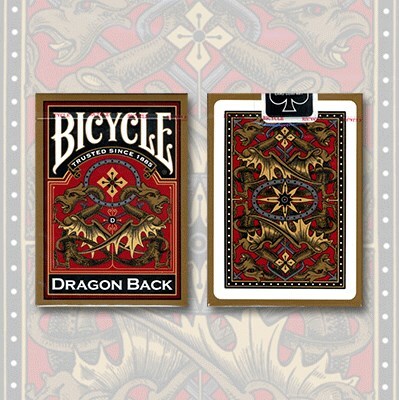 The Red Dragon Backs and the Gold Dragon Backs are my favourites in the series. Both have a muted maroon red instead of the usual garish colours, both on the red suits and the card backs. The Red deck has card backs with gold, red and green, while the Gold deck has card backs with just gold and red. The faces are quite similar, with standard looking courts, but with the Red deck it's gold, red and green, while the Gold deck it's copper, red, and blue. I can recommend both highly.